Grand Sweepstake : Subscribe Now and get a chance to win exciting prize in Lucky Draw!! Feel like wandering around Laos, watching the night sky in Arunachal, or eating tiny ricebird whole in Hong Kong? Outlook Traveller has been everywhere, and done it all. As the first significant magazine aimed squarely at the Indian tourist, Outlook Travel. Grand Sweepstake : Subscribe Now and get a chance to win exciting prize in Lucky Draw! !Feel like wandering around Laos, watching the night sky in Arunachal, or eating tiny ricebird whole in Hong Kong? Outlook Traveller has been everywhere, and done it all. 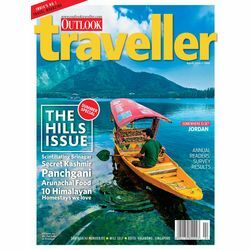 As the first significant magazine aimed squarely at the Indian tourist, Outlook Travel.